Chicago Teachers' Strike Forces Obama To Steer Carefully Between Two Allies : It's All Politics The Obama administration and the president's Chicago-based re-election campaign are trying to minimize the risks of offending teachers and union members by carefully navigating the tricky waters between Mayor Rahm Emanuel and the striking teachers. 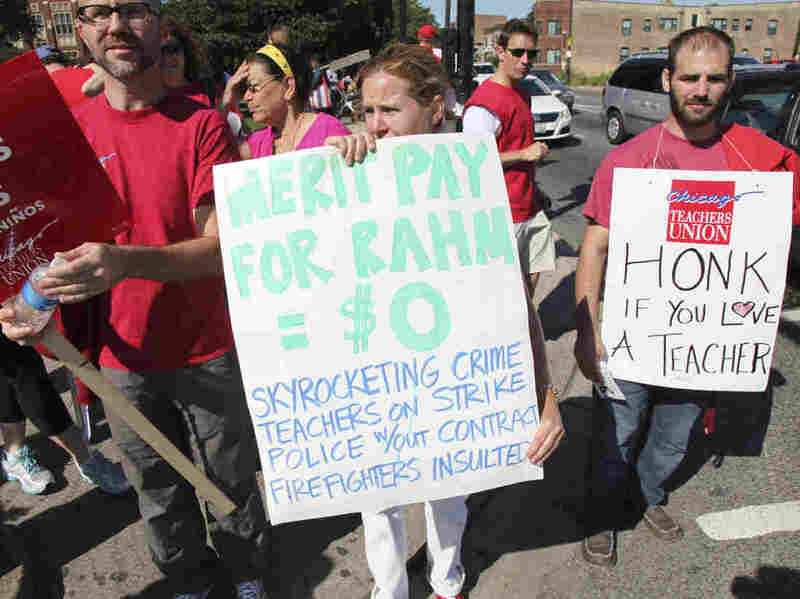 Striking Chicago public school teachers have a message for Mayor Rahm Emanuel on Tuesday. Getting caught in a fight between two important allies is not where a president locked in a tight re-election race would willingly choose to be. But that's where President Obama is today as he attempts for now to stay above the fray pitting the striking Chicago teachers against Mayor Rahm Emanuel who, in an earlier incarnation, was Obama's White House chief of staff. The Chicago teachers' union is part of a key Democratic constituency, organized labor, which the Obama campaign is counting on mobilizing for its all-important get-out-the-vote activities in the battleground states. If the president were to wade into the fight on Emanuel's side, he would risk alienating teachers and other union members in swing states. Not good if you're a president relying on many of those teachers and other union members to knock on doors and make phone calls. But then, not only is Emanuel a former top Obama aide; just last week it was announced that he would be taking on the new role of buttonholing Democratic millionaires and billionaires to raise big money for a pro-Obama superPAC, Priorities USA. All that helps explain why, when asked Monday if the president had an official reaction to the strike in Obama's very pro-union hometown, White House press secretary Jay Carney basically said, "no." CARNEY: "Well, I'm sure he's aware of it. I know he's aware of it. But I haven't spoken with him about it, so I can't speak for his reaction. I can tell you that as a — more broadly, that our principal concern is for the students, and his principal concern is for the students and families who are affected by the situation. And we hope that both sides are able to come together to settle this quickly and in the best interests of Chicago's students." "I hope that the parties will come together to settle this quickly and get our kids back in the classroom. I'm confident that both sides have the best interests of the students at heart, and that they can collaborate at the bargaining table — as teachers and school districts have done all over the country — to reach a solution that puts kids first." With Obama suddenly caught between two allies, presidential nominee Mitt Romney and other Republicans have tried to add to his discomfort. They've alleged that his relative silence amounts to tacit agreement with the teachers' union and disagreement with Emanuel. "I am disappointed by the decision of the Chicago Teachers Union to turn its back on not only a city negotiating in good faith but also the hundreds of thousands of children relying on the city's public schools to provide them a safe place to receive a strong education. Teachers unions have too often made plain that their interests conflict with those of our children, and today we are seeing one of the clearest examples yet. President Obama has chosen his side in this fight, sending his Vice President last year to assure the nation's largest teachers union that 'you should have no doubt about my affection for you and the President's commitment to you.' I choose to side with the parents and students depending on public schools to give them the skills to succeed, and my plan for education reform will do exactly that." RYAN: "I've known Rahm Emanuel for years. He's a former colleague of mine. Rahm and I have not agreed on every issue or on a lot of issues, but Mayor Emanuel is right today in saying that this teachers' union strike is unnecessary and wrong. We know that Rahm is not going to support our campaign, but on this issue and this day we stand with Mayor Rahm Emanuel." There was irony, of course, in Romney and Ryan backing Emanuel as though he were Gov. Scott Walker of Wisconsin or Gov. Chris Christie of New Jersey, who have become heroes in Republican circles for taking stands against public-employee unions. Romney's effort to use the teachers' strike to portray Obama as marching in lockstep with organized labor faces a potential headwind, which is that Obama has done anything but align with teachers on their issues. Obama and Duncan have embraced reforms that aren't exactly popular with teachers, changes embodied in the president's Race to the Top initiative. The administration's support for using students' standardized test results to evaluate teachers and for the firing of failing teachers haven't endeared him to members of the National Education Association or the American Federation of Teachers. Those, by the way, are some of the same issues at the heart of the current Chicago dispute. But the disagreements many public-school teachers have with Obama pale compared with those they generally have with Republican politicians, though it's important to remember that many public-school teachers are themselves Republicans. In any event, indications are that despite his advocacy of controversial reforms, Obama can count on the support of the majority of teachers represented by unions. SHAIKEN: "I think all sides in the Democratic fold understand the stakes in the November election. So I think the teachers, whatever the outcome in Chicago, will work very hard for the president's re-election." But the Obama administration and his Chicago-based re-election campaign are clearly trying to minimize the risks of offending teachers and union members generally by carefully navigating the tricky waters between Emanuel and the striking teachers. Meanwhile, it's possible that Emanuel's standoff with the teachers could wind up helping Obama by underscoring the very real differences that exist between the teachers' unions and the Obamians. The unstated message to voters could be that Obama, like Emanuel, isn't the raging liberal some of his political opponents try to make him out to be, but rather a Chicago-style pragmatist from "city that works." Even though right now, the teachers don't.